There’s a tradition at the University of Missouri that takes place each year after the final home football game. Win or lose, senior players make the climb up the grass-covered hill in the north end zone and choose a rock from the large white “M” built on the slope. The last game during my four years at Mizzou, against Iowa State in 2009, was also the last game for the winningest senior class in the school’s history. I remember watching Danario Alexander and Sean Weatherspoon, the two players whose presence defined the season, each select a rock and hold it up for the crowd that had gathered. And I remember thinking that in four years, coach Gary Pinkel had won 38 games with players passed over by college football’s elite. Both Alexander and Weatherspoon were two-star recruits, according to Rivals. On Wednesday, the prize of Mizzou’s recruiting class had five stars all his own. That, before he plays a down, is what makes landing Dorial Green-Beckham matter for a school like Mizzou. For those unfamiliar with college football’s yearly meat market, Green-Beckham was perhaps the most sought-after prize on National Signing Day — a player that schools like Missouri don’t often happen into. The 6-foot-6, 220-pound receiver put up video-game-type numbers during his high school career at Hillcrest High in Springfield, Mo. As a senior, his 119 catches went for 2,233 yards and 24 touchdowns, and with that, he became Rivals.com’s no. 1 recruit in the country. Now, I am quick to concede that the importance placed on high-profile high school recruits has reached absurd heights. That the Missouri coaching staff found out DGB would be a Tiger via TV is ridiculousness only possible in the Decision Era. This is a teenager who spent his high school career playing against mid-tier talent in a state not known for high school football. And the jump from high school to major college football is a hit-or-miss affair. I wouldn’t be surprised if, two years from now, DGB was just another college receiver catching 40 passes a year. Almost every sign points in the opposite direction, and the tangible, football contributions Green-Beckham figures to make would be immediate. The strange part is, that’s not what matters most. When I was at Missouri, the conversation about recruiting was always focused on how far a second-tier team could go. Even in 2007, when the Tigers were ranked no. 1 in the country and a game away from the national championship, there was a sinking feeling that they had little chance against Oklahoma in the Big 12 championship game. When a team is comprised of the players that schools like OU and Texas decided it didn’t want, that program is doomed to a lifetime of being an also-ran in a conference those schools dominate. Next season, Oklahoma and Texas will be replaced with Alabama and LSU. There have been players in the past who were touted as the ones that would swing the program’s future. Blaine Gabbert was the highly recruited, big-name quarterback that Chase Daniel never was. But it took Bill Callahan getting fired from Nebraska for Gabbert to wind up in Columbia. 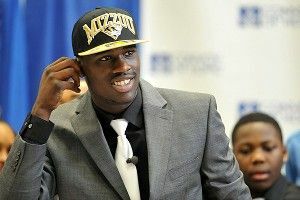 The Tigers were DGB’s top choice, and it was a choice he made with the world of college football watching. It was an announcement that can reverberate. For the next three seasons (at least), recruits will visit Columbia and ask: “Why should I come to Mizzou?” And the guy who was the best high school football player in the country will be there to answer them. Some will say that not much can be taken from winning a prized in-state recruit, that an SEC school should win those battles within its own borders. (And Pinkel may be one of them.) But I can guarantee that this wasn’t happening when T.J. Moe came to Mizzou Arena. Pinkel and his staff might do some posturing about expectations, but sorry, Gary. The proof is in the tape.